This recipe is my #1 requested recipe at Christmas. It would be good any time of year with a cup of tea. Enjoy! 1. In a medium, heavy saucepan, combine the sugar, butter, and corn syrup. Stir constantly over medium heat until the butter is melted and the mixture is smooth and combined. 3. Place an oven rack on the middle shelf of the oven. Preheat the oven to 325 degrees F. Line a baking sheet with parchment paper or use a Silpat sheet. 4. Roll level tablespoonfuls of batter between your palms into small balls (Note: I sometimes do smaller for teas) Place them on the prepared pan at least 2-3 inches apart. 5. 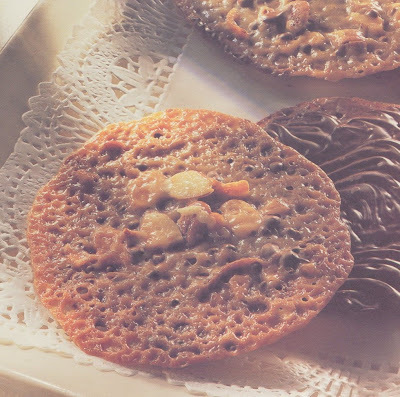 Bake the florentines for 7-10 minutes, until they are flat, lacy, and a deep golden brown. Remove the pan from the oven and allow the florentines to cool completely on the pan on a wire rack. 7. Use a metal spatula to remove a cooled florentine from the baking sheet. Spread 1 or 2 teaspoons melted chocolate over the bottom of each florentine. Give the florentine a decorative flourish by tracing a wavy pattern of lines across the soft chocolate, using the tines of a fork. Alternatively, you can sandwich 2 florentines together with melted chocolate in the middle. 8. Store florentines in a tightly covered container for up to 2 to 3 days. Update: The French Macaroons came from www.pixpatisserie.com They have two shops in Portland at: 3901 N. Williams and 3402 S.E. Division. Morning tea today was a lovely Yunnan black tea, given to me by a tea friend, accompanied by two French Macaroons. The flavors were Cassis for the purple one and Fleur de Sel for the speckled one. These are two of my favorite things and bring great joy. This morning my tea adventure was to France. Can you picture yourself sitting along a sidewalk cafe sipping tea, eating a french macaroon, and reading poetry or better yet sharing with a special friend? Earlier this month I received a card in the mail inviting me to an art show of 10 women artists. I went with anticipation and found handmade candles, cards, soaps, purses, jewelry, and more similar things. I left thinking these women are not artist, just craft people. Arriving home I decided to read my reading for the day. Can you believe the title of the reading was "You Are an Artist". In the reading it said, "An artist is someone with good listening skills who accesses the creative energy of the Universe to bring forth something on the material plane that wasn't here before." It is coming into each new day with an attitude of anticipation and listening, then creating a life most joyful and maybe even a little daring. Is it just picking out something out of the ordinary to fix for dinner, wearing something you weren't brave enough to wear in the past, painting a picture, singing a song, making a candle, rearranging a room in your home, or just writing a creative thought that came to your mind? Today let's do something you haven't done before. Trust your instincts, play, create, and grow. This is the true artistry of life. We are all artists in creating the life we have. Join me at the table for a few of my favorite sweets on this Fat Tuesday. Pavlova with thick whip cream, sliced strawberries and bananas, drizzled with chocolate. Or maybe you would rather have a French Macaroon or two. Very good with a cup of tea and a time of reflection. What is your indulgence on this day as we prepare for lent? 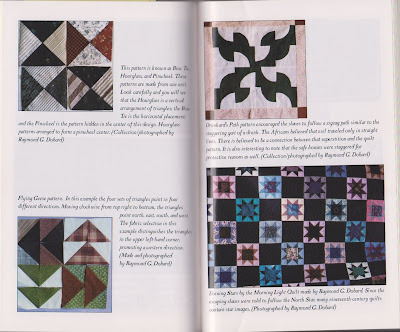 Quilts played a big role in the Underground Railroad. 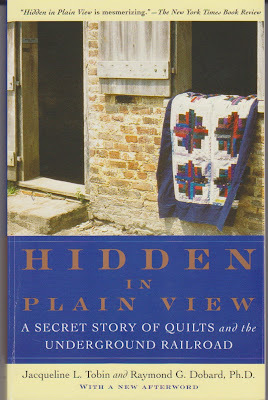 The book Hidden in Plain View, by Jacqueline L. Tobin and Raymond g. Dobard, Ph.D., tells the history of quilts during this time. There were secret symbols in the quilts which were used to communicate messages to escaping slaves. It has become the Underground Railroad Quilt Code. The quilts would hang outside the homes along the way to convey a message. The message may be to get ready, which direction to go, or whether the house was a safe house to hide. Harriet Tubman, known as the conductor of the Underground Railroad, was a quilter and made quilts for the slaves to keep them warm during the nights of hiding in the woods. Many different churches participated, such as the Quakers, by fighting the war against injustice. The stories for many years were passed on through families as a verbal history. This book takes the opportunity to put the verbal history of Ozella McDaniel Williams into written words. There were many more codes including knots stitched into the quilts. There is a rich history in quilts for African Americans, but also for many different ethnic groups and families. Here is a picture of my kitchen this week. I love my 1950's kitchen, but dear husband hates linoleum. He has hated it in every kitchen we have ever had; so he decided to put oak hardwood flooring in our kitchen this week. What a mess! There is no access to the kitchen, no stove, no microwave, and no refrigerator. We do have an extra refrigerator in the garage. Yesterday I decided I needed a break; so off to the nursery I went for a touch of springtime. Now I feel better. I am inspired to plant some flowers and enjoy. All the seed packets are so tempting. I came home with some primroses, forget-me-knots, and packets of seeds. Did you enjoy this little escape into springtime with me? Springtime makes my heart sing with joy! Now if I could only have my kitchen back. A pink smile is sent to you today. 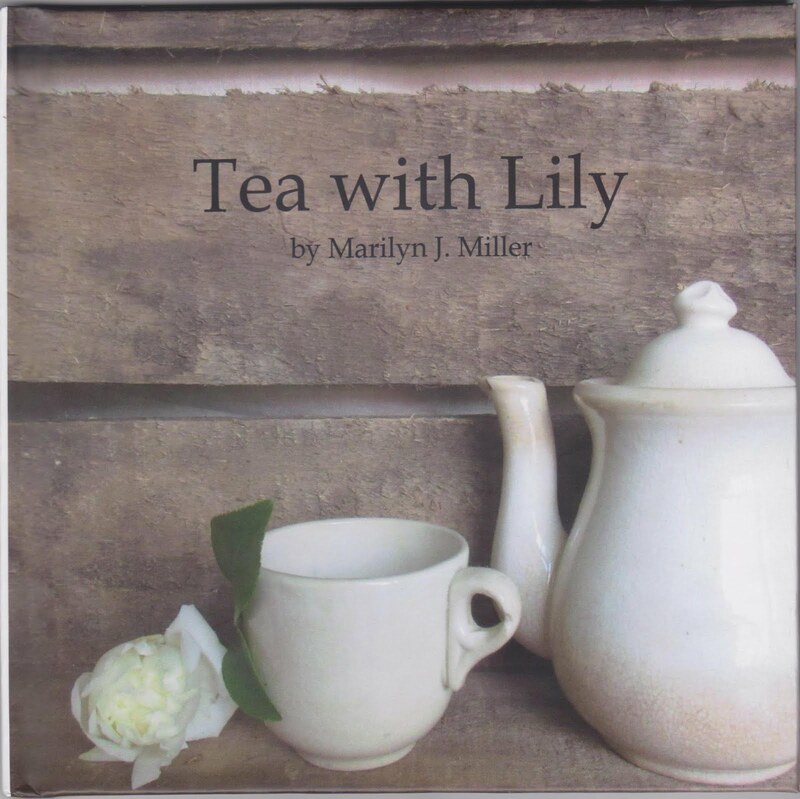 The following tea party for one creates a sense of intimacy with the one person you need to know best-you-and offers a feeling of sanctuary that will have you coming away relaxed and revitalized. 1. Creat an atmosphere of relaxation by arranging fresh cut flowers and playing soothing music. 2. Find a quiet comfortable place either on the floor or in a chair by a window so you can benefit from the natural light. 3. Steep the tea in a small pot to the desired strength. If you're using green tea, never use boiling water. "you want to extract the nectar contained in the leaf, not cook the tea," say James Norwood Pratt. Use water 30 degrees below the boiling point and steep the leaves for less than two minutes. 4. While the tea is steeping, notice what's going on around you-the light, the temperature, the weather. Don't think; just observe. 5. Before you take your first sip, give thanks for the quiet moment you have created. 6. During each subsequent sip give thanks for a different aspect of your life, such as friends, health, children, spouse, job. 7. On the last sip of tea, smile softly to yourself and say one last sentiment of gratitude, such as, "I give thanks for the great abundance in my life." 8. As you clean the teaware, contemplate how the ritual cleansed your mind and body. Take time for the ritual of tea today. Very rarely do I go window shopping, but last week I had the opportunity to do just that at Anthropology. What a fun place to window shop. There was everything from beautiful tucked and embroidered blouses to glass knobs for your kitchen cabinets. I found several tea themed items too, including these decoupage teapots. They actually were usable, with fabric applied to the outside of the teapot. How fun is that? Now we could just go wild with creating an original teapot, couldn't we? It certainly gets the wheels in my mind thinking. Have any of you decorated a teapot? What did you do? 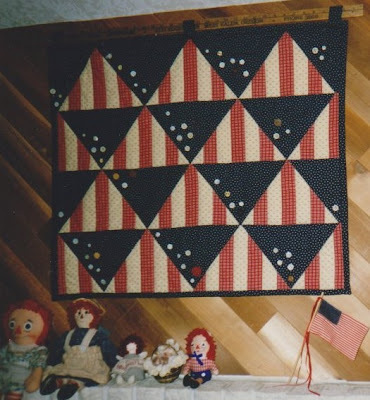 The quilt wall hanging was inspired by an African quilt I once saw in a book. That one was shades of brown and where I put the vintage buttons there were french knots. Often quilts had a mistake built into the quilt; so on this one I did just that. Can you see where the planned mistake is? In the mid 1990's the church we were attending was getting ready to celebrate their centenniel year. They asked me to come to a meeting to discuss the possibility of doing a centenniel quilt. After much discussion I realized I would be taking all of their ideas and incorporating them into a quilt design unique to the celebration. The church had been located in two different locations over the 100 years; so I photographed both church buildings and the stain glass in both locations. Then turned the photographs into quilt sections to be appliqued and embroidered by members of the church. 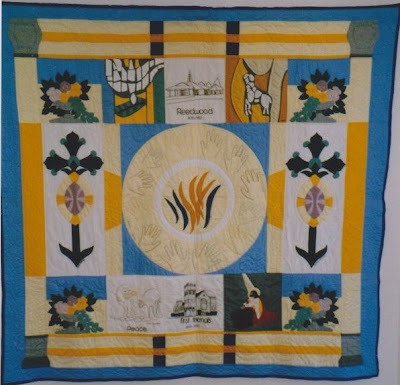 The center is the church logo, the embroidered hands are of the children of the church, the building at the top is where they are located now, the building at the bottom is their previous building, and all other pieces represent the stain glass. I chose the color combinations to best represent the windows, made little kits for each person to sew, then when they were completed I pieced the quilt. Members in the church hand quilted it. It was a real labor of love and one that now hangs in the church. Quilts can tell so many stories and it was great fun for me to be a part of each of these two quilts. would make my valentine for my husband. Happy Valentine's Day to each one of you! Take time to stop and relish love. Is Tea the way to a man's heart? I am not sure if it is the offer of tea or being coy that is the way to a man's heart? 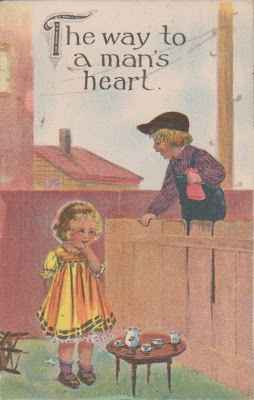 A vintage postcard. I don't think we would be seeing this today, but it is fun to see how people thought in the past. What is the way to your man's heart these days? Is it the offer of a cup of tea or just offering your heart? As we are approaching valentine's I can't help thinking about things of the heart. 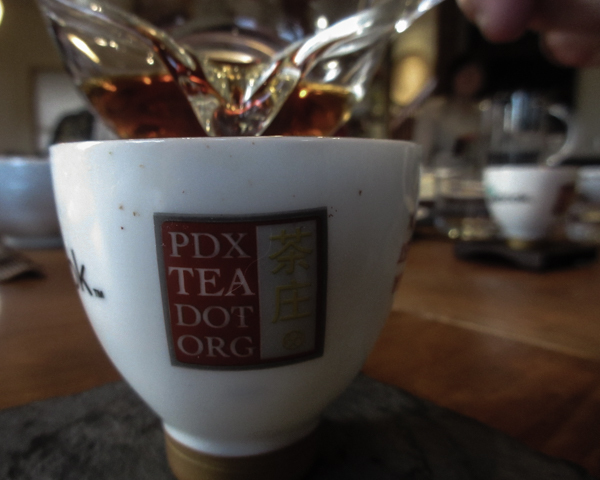 Yes, that is me having tea this week at the Jade Teahouse in Portland, Oregon. There is a new Vietnamese teahouse here. I enjoyed a small pot of TiKuanYin oolong along with a lovely Sweet and Sour Soup. My friend, who had recommended Jade Teahouse, had a lovely sandwich with marinated fresh veggies on a baguette made fresh daily in the teahouse. This was a different kind of tea room, but one I am sure to enjoy again in the future. 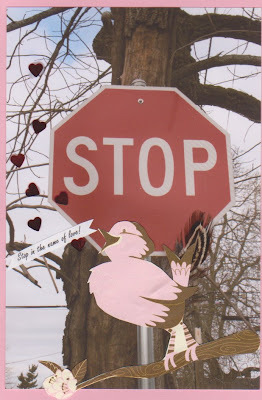 Several years ago I made this card for Christmas, but looking at it today I felt it was appropriate for Valentine's also. Inside it said "Open your heart to peace". I hope each of us keeps peace in your heart. Recently I read Practicing Peace in Times of War by Pema Chodron. In the book she talks about having a change of heart, softening what is rigid in our hearts and minds. 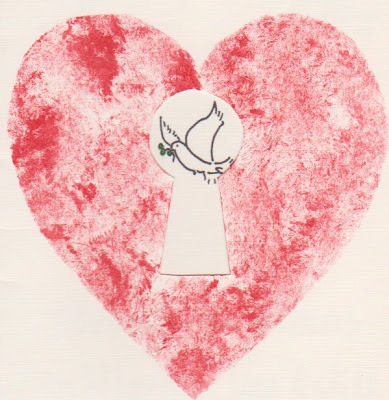 So as we approach Valentine Day and have thoughts of the heart, let's remember to soften our hearts to those around us and in the world. Community and Craft". Jane's books give a wonderful picture of life on the Oregon Trail. A typical log home of the early period of Aurora is open at the museum. Aurora is full of antique shops. Each is fun to visit and explore. My favorite shop in Aurora is Ida Red's Antiques & Treasures. You can find them online at www.idareds.com It isn't the largest, but then I like that. It isn't overwhelming. collection of hankies be pretty used on the tea table for napkins? A very pretty pitcher and goblets. Ida Red's is just one of the special treasures to be found in Aurora, Oregon. It takes about 1/2 an hour to travel from my home in Portland. Now I wonder why I don't venture there more often. It's a fun place to visit and you never know what might travel home with you. 20 quilt blocks were given to me about a year ago. My mother-in-law loved quilts and had a stash hidden away in her closet. When she moved to a retirement community, she could no longer keep her hidden stash. The quilts were divided. Because I am the only one that sews, the 20 quilt blocks came to me along with another unfinished top. They are very old and were probably made by my husband's grandmother. Some of them look like a mouse has chewed on the corners. I know I would never get a full quilt made; so I wondered what I would do with them. Then, visiting the Tea Masters blog, I was inspired to make tea mats/quilts. 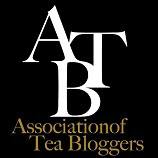 Visit his blog and see the beautiful tea quilts displayed under different teapots. So this week I will begin the adventure of turning these beautiful, but old quilt blocks into tea quilts. This will be my creative endeavor this year. "Life's all about moving your patches around." What unfinished project do you have lurking in the closet? How do you move life's challenges to make something beautiful? It may not be what was originally intended, but something that is wholley who you are. 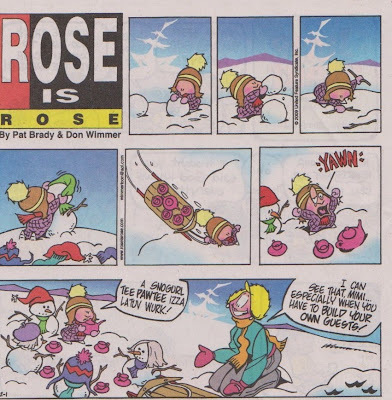 Isn't a Snow Girl Tea Party a lot of work? when having a tea party. Have a great weekend full of warm cups of tea. They will warm your heart as well as your hands. Picture was taken in Venice. 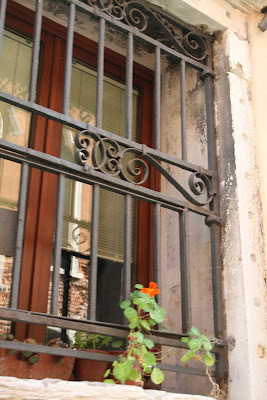 A window with one lone nastursium. Asking is a difficult thing for me to do. What about you? Why is it the we think we can be self sufficient and don't need to ask or accept help when needed? I have been thinking on this thought this week and have been confronted with several quotes, then this morning my reading was on just this thought. In Simple Abundance it was written that "Asking is the way of activating spiritual electricity." It helps us to see more clearly. In these times of hunkering down economically sometimes we need to ask for prayer, support, or just help to carry the load. I remember one time I was trying to carry alot in my arms and I kept dropping things. Someone came along and offered to help me carry the load and I said, I can do it myself. He kept insisting as I kept dropping things. Finally I accepted the help and he walked with me and shared the load. It was amazing to have someone walk along with me and share my load. Now I ask myself, why did I think I had to "do it myself". As we move toward Valentine Day my mind tends toward chocolates, hearts, love, along with some tea. This is the perfect treat for Valentine Day, a red velvet cupcake with a candied rose petal sitting on top. Of course red is the color of choice this month. Beside warming us it signifies the heart. My heart tucked on the top of the cupcake is glass, but isn't it pretty sitting there in that cloud of sugar? My red teapot comes out to celebrate the season. Since black teas are sometimes called red teas, I think a nice black tea for the cold winter day would warm us well. I am beginning to learn that is is the sweet, simple things of life which are the real ones after all. Now wouldn't a red velvet cupcake and a cup of tea be the perfect sweet, simple pleasure for a cold winter day? Welcome to The Oregon Garden in winter. There is some color here. The children's garden within the garden has fun topiaries. And flower pots used in an unusual way. The reflection pool showing the stark winter garden. The Oregon Garden, in Silverton, Oregon, was opened to the public about 8 or 9 years ago. Oregon plants and trees. I hadn't been there since it first opened up. Even in winter it was a pleasant walk; so peaceful and inviting. There were daffodils beginning to show there green leaves coming out of the ground. Soon life will return to the gardens. Now I look forward to visiting again in the spring or summer. If you travel to Oregon, The Oregon Garden's are a best kept secret that are worth visiting. my quilt series here on Delights of the Heart. the upcoming Monday's on quilts. A closer view of the center of the first quilt picture. The white flowers were slightly three dimentional. details in it from embroidery, applique, and quilting. The quilting was beautiful in this tie-dyed fabric. you could purchase from The Brass Needle in Dallas, Oregon. It is called the Tea Time Quilt. I liked the old screen door with the quilt display. since it wasn't raining we were able to walk through the winter gardens. a friend. Tea and Quilts was the perfect combination. I have been a little slow blogging lately, but I should improve soon. My office/craft room was moved to another room in the house. Then setting up a new computer and the room took more time than I thought it would take. Isn't that always the way it is? I am so looking forward to sharing quilts with you for the next few Mondays. One of my loves.